In today's post, let the grass to move to the blue track, talk about futsal. 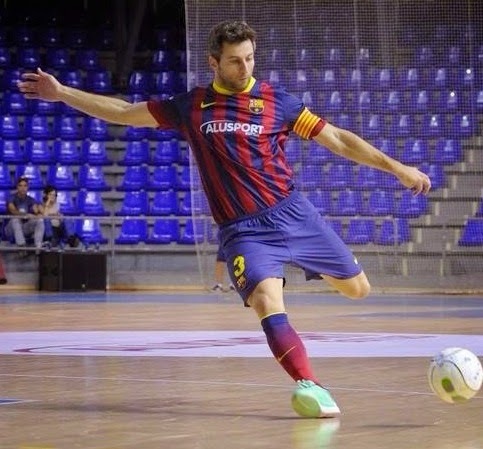 We talked about Jordi Torras, a legend of futsal, which currently plays in Italy. Jordi Torras Badosa (San Vicenç dels Barcelona, Horts, ​​September 24 1980) was a full international and FC Barcelona, ​​InterMovistar, Polaris World Cartagena among others. Jordi Torras in Barcelona as captain, 2014. Raised in the quarry training of FC Barcelona, ​​this winger-close has a brutal technique and physical power that made ​​him play until his 34 years at the club European champion as captain. Jordi is a player who has done everything in his international career. World Champion in China-Tapei and European Champion three times. In terms of clubs, the Catalan firm an enviable track record. Being in Inter Movistar and FC Barcelona a key player and much admired-. One of his best goals. Incredible goal against Marfil Santa Coloma. Currently plays for Italian Asti, Primera Division club fighting for the league championship. Massimo Tabbia team is second and since its inception in 2005 has achieved five consecutive promotions, achieving the Coppa Italia last season and being a benchmark for the Italian competition. If this team continues this evolution will soon see in Europe fighting for titles. Great post! Its amazing for futsal lovers. Best wishes! !